On March 29, 2019 Michael Metz, author of the new book Radicals in the Heartland: The 1960s Student Protest Movement at the University of Illinois gave a lecture at the YMCA Friday Forum for their series RESIST: Building a Culture of Nonviolence. 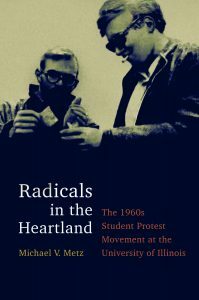 Radicals in the Heartland tells the story of the student protest movement at UIUC that reached a flashpoint in 1969. A participant himself, Metz draws on interviews, archives, and newspaper records to show a movement born in demands for free speech, inspired by a movement for civil rights, and driven to the edge by a seemingly never-ending war. If the sudden burst of irrational violence baffled parents, administrators, and legislators, it seemed inevitable to students after years of official intransigence and disregard. Metz portrays campus protesters not as angry, militant extremists but as youthful citizens deeply engaged with grave moral issues, embodying the idealism, naiveté, and courage of a minority of a generation. Watch the video of his lecture and learn more about this fascinating piece of UIUC history.